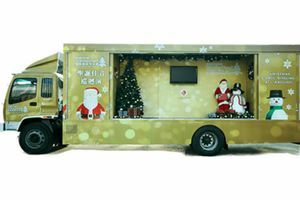 Moving showroom / Mobile exhibition truck / Promotion truck / Moving Stage are useful and effective outdoor promotion tools that enable brands to reach different customers in different hotspots. They are ideal for pop-up stores and product launches. Such mobile showrooms on trucks are very popular overseas. Guests can get into special vehicles to get unique customer experience. These mobile showrooms can go anywhere, especially to make brand promotion in any high rental area at low costs. Furthermore, you can promote directly to your target segment. This enables your marketing plan more flexible, initiative and efficiency.